Welcome. 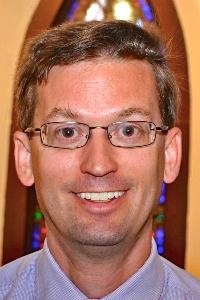 I am the pastor of Trinity, UMC, Rev. Andy Peck-McClain. I have served as pastor of churches on Staten Island,NY, Durham, NC, Cornwall, NY, and Rockingham County, VA. I am called by God through Jesus Christ to be God’s living presence in the world, to proclaim justice to all people, and to grow deeper in our spiritual relationships to God. I love being outdoors, walking and listening to God. I have discovered spiritual practices that embody movement and nature to be particularly powerful. Time with my family, my wife Emily, and our children, Zoë, Phoebe and Ezra, is time well spent with God. I find God present in those moments of playing, eating together, and simply being a family. I am also a reader, someone who enjoys listening to music – especially jazz, and I enjoy exercise. And as a lesson in continual patience, I am a big fan of the New York Mets.